IF you’ve ever forgotten to mute yourself while feeding a noisy infant on a live call…. Pull up an earbud and get comfy, mamaface. 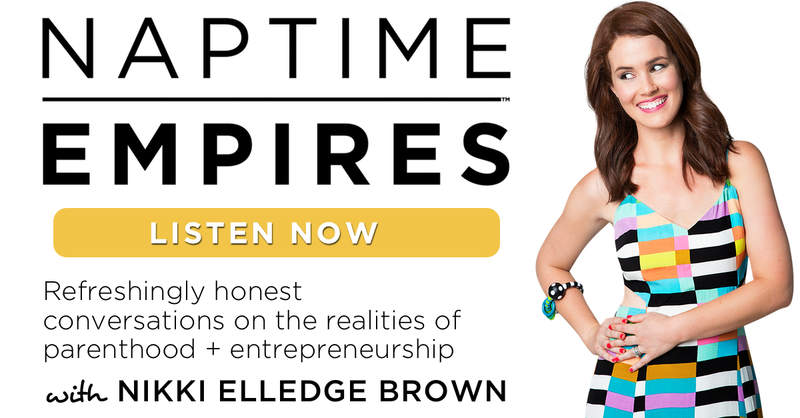 I’m Nikki Elledge Brown, host of the Naptime Empires™ podcast – refreshingly honest conversations on the realities of parenthood + entrepreneurship. Take a listen + see what YOU think! The name Naptime Empires™ came to me in the form of an unsolicited divine download years ago. To be honest (and why wouldn’t I be? )… I don’t totally know what it is yet. For now, it’s a conversation, currently in podcast and FB group form – where we can talk about the real-life stuff – the good, the bad, the ugly that comes with building an empire with little ones in tow. How we honestly – and I mean HONESTLY – want to feel when wearing the hats and spinning the plates and juggling the (soccer) balls.